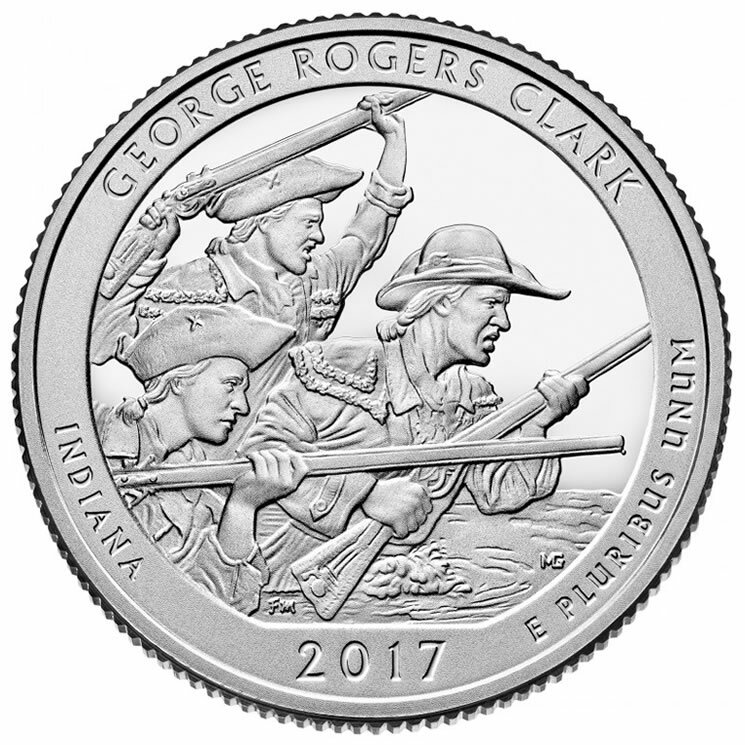 George Rogers Clark National Historical Park of Indiana is the final national site honored with a U.S. quarter for 2017. It represents the fortieth of fifty-six releases from the United States Mint program of America the Beautiful Quarters®. its official launch ceremony by the U.S. Mint and the National Park Service at Riverfront Pavilion (102 N 2nd St., Vincennes, IN 47591) on November 14, 2017 at 10:00 a.m. EST. Coin forums offer an opportunity for the public to learn about current and upcoming coin products and express their views about coinage. Quarter ceremonies and coin forums are open to the public and free. Coin exchanges occur right after quarter launch ceremonies. They are at the same location of the event and give attendees a chance to exchange cash for $10 rolls of a newly released quarter. It is often very difficult to find new quarters because it can take months and sometimes years before they appear regularly in change. Easier methods of getting them include coin exchanges and buying them straight from the U.S. Mint (www.usmint.gov). Eleven reverse candidate designs for the quarter were developed by the U.S. Mint in consultation with representatives of the national park. The Treasury Secretary selected the final design after the Commission of Fine Arts and the Citizens Coinage Advisory Committee reviewed the candidates and offered their recommendations. 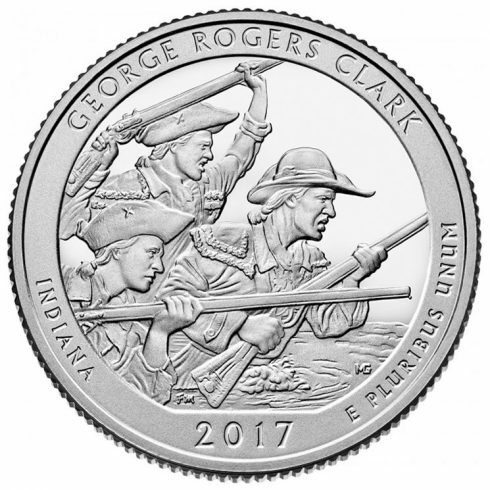 Created by Frank Morris and sculpted by Michael Gaudioso, the selected design depicts George Rogers Clark leading his men through the flooded plains approaching Fort Sackville. Surrounding the scene are inscriptions reading "GEORGE ROGERS CLARK," "INDIANA," "2017," and "E PLURIBUS UNUM." All quarter obverses (heads) share a common portrait of George Washington as created by John Flanagan. Both obverse and reverse designs are also on a series of U.S. Mint bullion and collector 3-inch diameter, 5-ounce silver coins. Ellis Island (Statue of Liberty National Monument) (New Jersey). George Rogers Clark National Historical Park of Indiana marks the area where George Rogers Clark led a group of frontiersmen to take back control of Fort Sackville. At the time of the attack in 1779, Fort Sackville was under British command. Thanks to General Clark, the Americans were able to gain control of a vast expanse of land that was almost the size of the original 13 colonies. General Clark was also known for founding Louisville, Kentucky, and taking back several other forts that were controlled by the British. While Fort Sackville no longer stands, the park is located in the same area of where it was believed to be located. As time went on, the fort’s exact location was lost. Archaeological investigations from 1969 to 1971 found portions of stockade walls but their origin was impossible identify due to the closeness of the 1732 French stockade, Fort Sackville, and the 1812 Fort Knox III. In 1930, the memorial for George Rogers Clark was created to honor the victory over the British.